Microwaves for many people are an appliance sent from heaven thanks to convenience, ease of navigation and fast cooking. 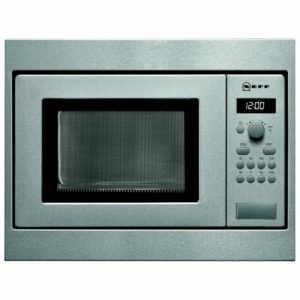 Whether you require a basic microwave, a combination model or a microwave with an integral grill, we have it. Some models offer superb traditional cooking results by using a combination of fan oven, microwave and grill to reduce cooking times. So you can roast chicken, steam vegetables and bake cakes, all in a fraction of the time it would take in a traditional oven. Be sure to consider the location of the microwave as some models are suitable for a tall housing unit & others a shallow depth wall unit. 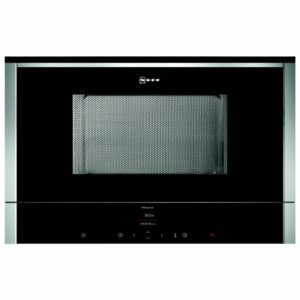 This built in microwave from Neff certainly offers great assistance when you need to cook. Finished in black with an Easy Clock with silver display and retractable dials, it looks brilliant alone or paired with other items across the range. Boasting seven programmes and five temperatures there's plenty of options for warming and defrosting! 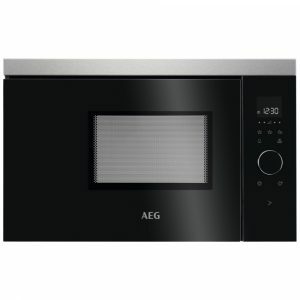 This easy to use and maintain built in microwave from AEG is a great addition to a modern kitchen. 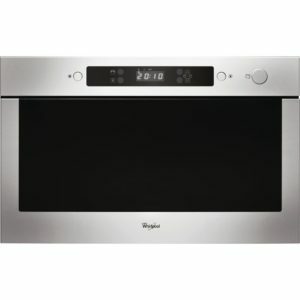 Finished with a stainless steel trim, the MBB1756SEM looks fantastic matched with other appliances across the range. You can open the door with ease as it has electronic touch-activated features, making life easier for you. With easy to use controls and an easy wipe clean interior, you will wonder what you did without this helpful kitchen assistant. 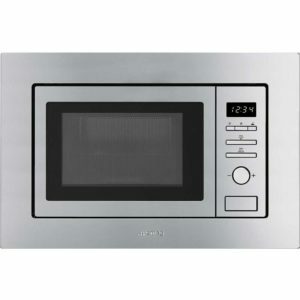 Perfect on its own or alongside matching appliances, this Neff built in microwave has a capacity of 17 litres and is finished in stunning stainless steel. With seven cooking programmes, retractable controls and InnoWave technology for even heat distribution, it will be a handy kitchen helper! This Neff built in left hinged microwave has a capacity of 21 litres. Finished in stunning stainless steel it matches perfectly with other items across the range. TFT colour displays and shift controls make the C17WR00N0B incredibly easy to use. InnoWave technology provides even heat distribution and with seven automatic programmes you will be able to choose the best option every time you need to warm up or defrost! 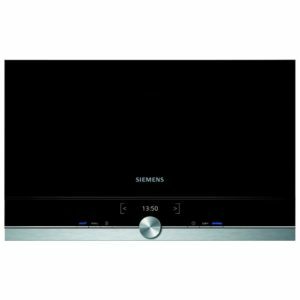 Quick and convenient cooking from Siemens! What's not to like about this built in microwave? With 5 power levels and automatic cooking programmes, you can cook, defrost and reheat with ease. Finished in stunning stainless steel and with a range of matching ovens available, the BE634LGS1B is the perfect addition to your new kitchen. 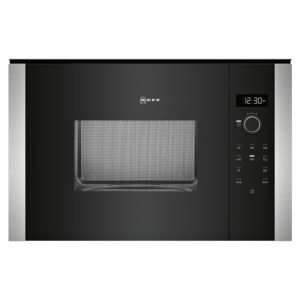 With 8 built in programmes and a 20 litre capacity, this built in microwave and grill from Smeg offers great flexibility. Finished in stunning stainless steel and with a range of matching ovens available it's the perfect addition to your new kitchen. Quick and convenient cooking from Siemens! What's not to like about this built in microwave? With 5 power levels, you can cook, defrost and reheat with ease. Finished with stunning stainless steel and with a range of matching ovens available, the BF634LGS1B is the perfect addition to your new kitchen. 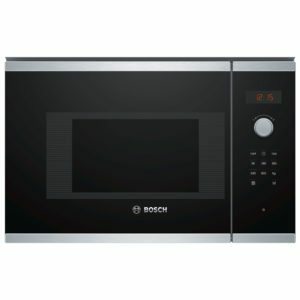 This sleek and modern Bosch built in microwave in brushed steel and black glass would be a fabulous addition to your kitchen. It has 5 power levels so is ideal for defrosting, reheating and cooking. With a really roomy 20 litre capacity and AutoPilot8 with 8 preset programmes, this 800w microwave will offer convenience and versatility to your cooking. Say hello to the perfect addition to your kitchen! 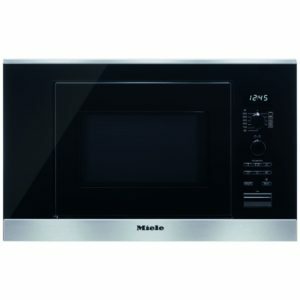 This superb built in microwave and grill from Miele gives you perfect convenience cooking and it looks pretty great too. Offering a 17 litre capacity, a microwave with 6 power levels and an 800w grill you'll have all you need for grilling, cooking or heating food quickly. Finished in stunning stainless steel with an anti-fingerprint finish it's sure to complement any kitchen and if you love Miele appliances you'll be pleased to know that there is a range of matching ovens available too. This Neff built in microwave, hinged on the right, looks brilliant with stainless steel trim and matches perfectly with other appliances across the range from Neff. With seven programmes, the C17WR01N0B is fantastic whether you are heating up food or defrosting. Utilising InnoWave technology from Neff, it promises even heat distribution and with easy to use Shift Controls and TFT colour display it is a great addition to a busy household. This Whirlpool built in microwave has a capacity of 22 litres. Finished in stunning stainless steel and with a range of matching ovens available it's the perfect addition to your new kitchen. 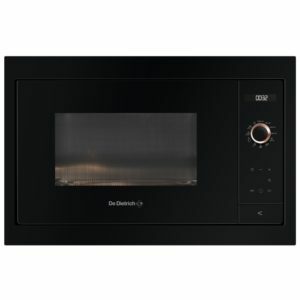 This De Dietrich built in microwave offers superb versatility. Finished in stunning black and with a range of matching ovens available it's the perfect addition to your new kitchen.